When you start a game as a passive team with 3 forwards setup two players in both side areas. These gives you option to get players in all areas except areas touching goal lines after first moves. This action will block easy passes next turn. 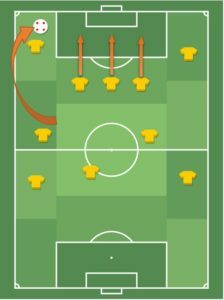 With 3 forwards goal attempts should be made in the box rather than any adjacent areas. 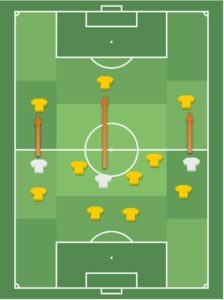 Three forwards offer a great chance to get several players quickly in the box. When you control the ball, move forwards to both corner areas to get two options for a target area in next turn. In the same movement sequence take care that you will have enough player in the front of box ready to move forwards to the box next turn. In the next turn play the ball to the corner area, which after your forwards will not be an offside position in the box. Then push three forwards to the box. If you play the second action stage and your opponent drop the defenders to the box then you can just make fewer number of moves and get the first action stage next turn and play ball to the area front of the penalty area.